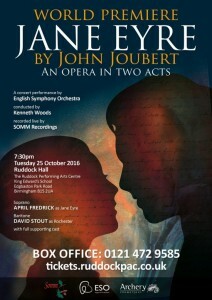 "The tears in our eyes at the end of this professional premiere of John Joubert's opera Jane Eyre were quickened not only by the ravishing music of Jane and Rochester's reconciliation, but also by the sheer emotional importance of the occasion. But on Tuesday at last Joubert's vision was fulfilled, and, surrounded by his family, the now frail composer acknowledged tremendous applause after what was a tremendous performance of what is indeed a tremendous score, and with an adroit libretto by Kenneth Birkin. Everything about this performance had in fact been so well prepared. All 12 singers, from the tiniest parts to the most imposing roles, delivered with character and aplomb...minor parts were all well taken, not least by Gwion Thomas and Alan Fairs, who brought huge personality and characterisation to their roles." Pamela Nash for Bachtrack says "The support from cast members, notably Lesley-Jane Rogers and Clare McCaldin, was exemplary..."; Bob Matthew-Walker's review will appear in the January edition of Musical Opinion and John Allison of Opera Magazine has also written a piece for the Daily Telegraph. Congratulations to Kenneth Woods, who conducted the English Symphony Orchestra, and Siva Oke of Somm Recordings, who will be releasing the opera on CD in the spring.